In a democracy, we generally assume that voters know the policies they prefer and elect like-minded officials who are responsible for carrying them out. We also assume that voters consider candidates' competence, honesty, and other performance-related traits. But does this actually happen? Do voters consider candidates’ policy positions when deciding for whom to vote? And how do politicians’ performances in office factor into the voting decision? 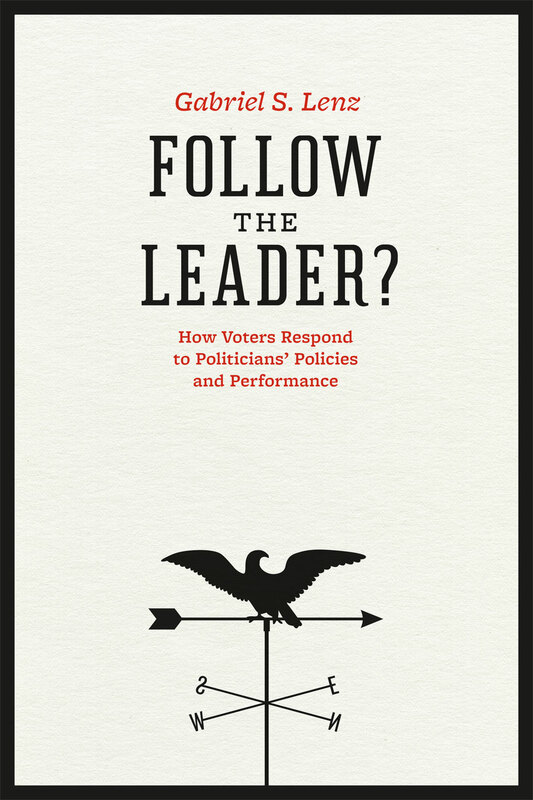 In Follow the Leader?, Gabriel S. Lenz sheds light on these central questions of democratic thought. Lenz looks at citizens’ views of candidates both before and after periods of political upheaval, including campaigns, wars, natural disasters, and episodes of economic boom and bust. Noting important shifts in voters’ knowledge and preferences as a result of these events, he finds that, while citizens do assess politicians based on their performance, their policy positions actually matter much less. Even when a policy issue becomes highly prominent, voters rarely shift their votes to the politician whose position best agrees with their own. In fact, Lenz shows, the reverse often takes place: citizens first pick a politician and then adopt that politician’s policy views. In other words, they follow the leader. Based on data drawn from multiple countries, Follow the Leader? is the most definitive treatment to date of when and why policy and performance matter at the voting booth, and it will break new ground in the debates about democracy. Chapter 1. Rum Punch or Issue Voting? Chapter 5. Learning Positions, Changing Votes? Lucid and engaging, Follow the Leader? revisits the longstanding debate about whether the electorate chooses candidates based on their policy stances. Adducing evidence from a broad array of countries, eras, and issue domains, Gabriel S. Lenz offers a smart and nuanced critique of the ‘issue voting’ literature, arguing that voters often evaluate candidates based on performance but rarely do so based on policy positions. A must-read for anyone interested in public opinion and democratic accountability. In studying the movement in opinion and behavior, Gabriel S. Lenz brings both good and bad news. The good news is that politicians’ attempts to control the issue agenda in campaigns are not as successful as some of us feared. The bad news is that, instead, citizens mainly—and rather blindly—follow cues from politicians they already prefer. Exploiting existing and underused panel data, Lenz burns through observational equivalence, providing a model not just of clear-eyed analysis but also of patient exposition.